Save up to 57% off the annual newsstand price! 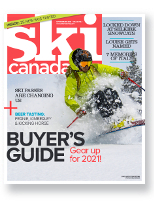 Annual Buyer's Guide with specs on hundreds of skis and Canadian pricing! Test reports on the newest skis! Competition coverage, great photography, and much more! Regular rate: $15 per year, plus GST/HST.